Leilani Weis, Leonardo Lambruschini, Mario Ghezzi for supporting this showing. There were around 75 people at the screening including Lior and Alyssa. Most people went directly into Jamming afterwards and 13 people stayed to create this discussion. Participant A: I have a question about the way of life. 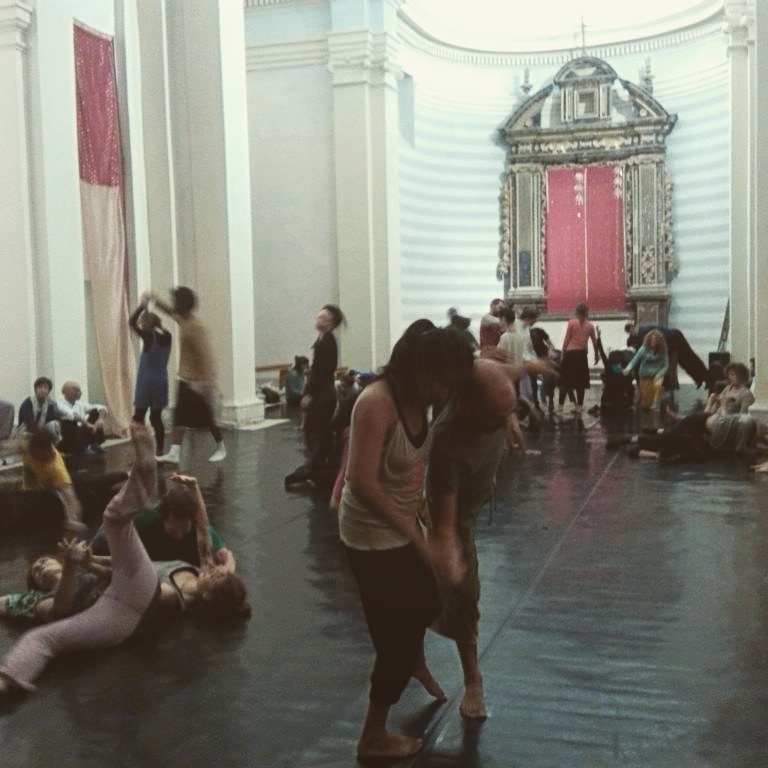 If all people on the planet could live like a commune of Contact Improvisation, is it Utopia? Now, I don’t know. This question just appeared now. Maybe I will find the answer. This movie gave me great inspiration. To realize in this moment, I am here in this place, between people in the same like utopia situation and I have lots of emotions. Maybe later I will have more thoughts about questions, a sense about what people were talking about, but now I have many great emotions. B: When I started meeting Contact Impro. Just a few years ago, I really fell in love with that. I really needed that. I had stopped ten years of psychoanalysis. And I felt somehow without one of my two legs. I had to find a new way to deal with the world without that big thing I’d been using to deal with the world. And I just fell in love with it. And I perceived there was something in it that was helping me deal with the world and somehow it was also helping me in going into a kind of utopian world for those few days or few hours. And after a few years now I think it is very nice but this is not a utopia and I keep it in my real world which is made of everyday life’s job whether I really like it or not, everyday relationships, friends, people you work with, boring things you have to do every day, annoying things you have to do every day. I try to feel now festivals less and less like a utopia, a moon where I can go for a week trip and then come back. And I’m trying to bring Contact more and more into my everyday life, knowing that it’s not my job and it won’t be my job. And it will be my every day life style. But keeping these firm ideas I think it’s a good balance between the need of something always beautiful, always nice, always good. I would love to be dancing everyday of my life but it just doesn’t seem my life. 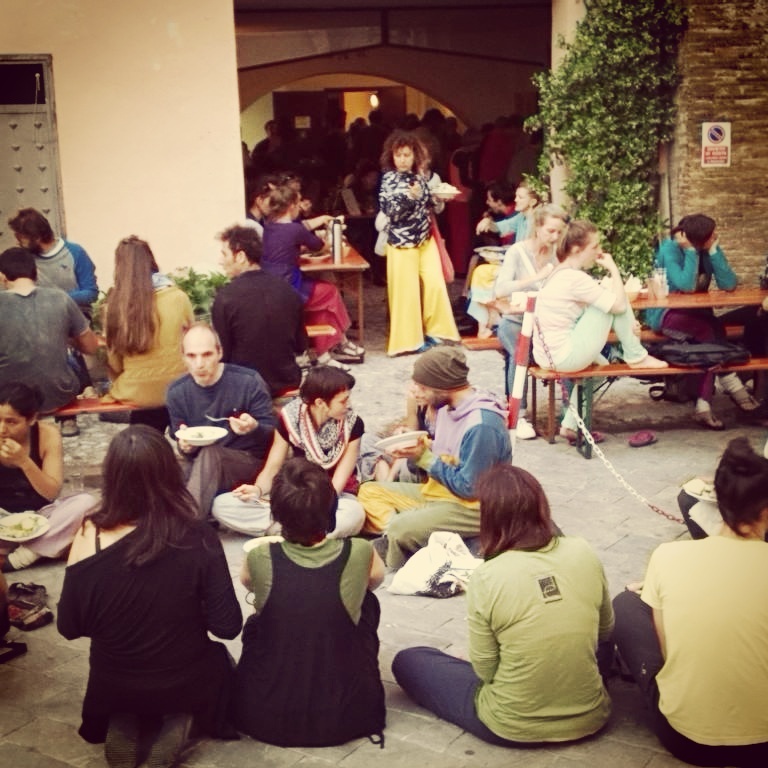 And this beautiful thing we are doing here so thanks to this festival and the other festivals this is an option to put more contact improvisation in to my every day life more than I do every day in my regular life. C: What he says answers to my thinking. It helps a lot what you just said. Because when you asked the question ‘what is your intention about this festival’ I was like hmmm, why should we have an intention? and Is a festival different from what is happening in general? and Is Contact Improvisation something different in a festival and something different in our lives? and Is being in Italy any different than being in Greece?, etc. etc. etc. And so if you put an extra break in what I’m feeling that finally for me it’s important to do as you say, to not give much extra attention to what’s happening in a festival or in a class or jam but somehow find a balance in between everything because Contact for me is a way of life but my life is not only Contact, if that makes any sense. So I think that Contact can be applied to many different parts of my life. But it’s Contact and not Contact at the same time. If that makes any sense, I don’t know. I’m also a psychoanalysist for three years now and I think it’s the same thing actually so when I’m doing psychotherapy am I doing Contact? and when I’m doing Contact am I doing psychotherapy? Or when I’m doing modern dance, contemporary, or when I’m performing, or when I speak to my friend am I doing Contact? So I like to think it’s good not to give so many importance like the girl that was talking about how to be clear and simple. I like this idea also. To be simple with Contact Improvisation but being complex at the same time. That’s what I think. And also I like the fact that we speak right now. It’s important. We all go to festivals and we don’t give time to just exchange some thoughts about Contact and I think it’s also part of the job. D: For me it’s about what CI brings to the individual and what the individual brings to the community. It’s different from Contact dance with a friend or someone in Greece. It’s different to come to a festival because you are always with people all day so CI is 24 hours. All of the experiences are CI, how we relate. For me I have to bring something or do something or help somebody or to make a service otherwise I don’t connect properly and this is very powerful I think with the dance. It brings, let’s say, confidence with who you are if you find your place among people and I mean to follow your need to be clear and sincere with yourself like ‘now, I want to be alone, now I want to dance, to start feeling more your needs in this structure of dance. This brings me much more information as I grow older. In the beginning I was focusing only to develop dancing techniques and skills and now I am in this phase. E: I was very happy to hear that guy (Lemmer Schmid) at the beginning of the film who said that Contact is about a beauty that can’t be seen in a video. That’s something I’ve been looking for. I had done Contemporary dance before CI but that’s what I’m really attracted to in Contact. Of course there are many things, principals of the community and what you practice, but I think about what he said; the found humanity in Contact. The fact that we’re generating.. You cant just attended to that when you look at people dancing. Like with meditation you’re not the person who lives it. And I’m more and more interested in the dimension inside each moment. I keep finding reasons to dig that emotion that is for non-contacters/non dancers in my experience. I think it’s a form that allows everybody to get in the activity and to feel, to live the essence of the activity from the very first minutes of practice when it’s wisely connected. I would even say, over the years, I’ve been looking at many videos online of CI and I think many of them are counter-productive because maybe 85% of the time they are promotional and they insist on the visual and chiefly the acrobatic elements which for me is not the essence, well, –that’s part of it, that’s one of the dimensions of it. That acrobatics means different things for different people. F: We have the possibilities to take workshops and then learn from the exercises and let you think that openly in the jams. It feels really good to learn to use my intention. I like the part about desire because I also have spent much time to think about my needs but it’s nice to think about desire. My desire was to put together the taking care of me and of the others simultaneously. It’s not about cognuity. It’s about presence. It’s a little bit a challenge for me here. One possibility is to think I am here so this is not a problem. But I think the political issue then it’s not ok. If I think about other people with wheelchairs it’s really difficult. G: For me CI is something that has to do with entering neurological information. Let’s say, the neurological part is very easy. Information comes to the center and electricity and the information goes form the center to the outside. In this way we move. When we receive the information, we feel. So there are these two differences. Very easy. There are a lot of nerves with these two highways of information. So, as I am studying anatomy for my job, in contact improvisation it is something you are receiving through contact with the eyes, with all your senses and perceiving. And when you have to improvise. From my point of view, improvisation means that you move without the willing, what you want to do. So it’s like Itay [Yatuv] said once. It’s like a big mistake. So CI is maybe a mistake. Yeah, because from my personal point of view, I’m doing really CI when I fail. When I am doing something that is unexpected, like an accident. Accidents are good from this point of view. Everybody is talking about the center in the body. I never danced before I am studying CI since two years and I met some dancers and they always talk about the center. I study anatomy and I don’t know what is the center of the body. We have different points of view. Neurological center is in the spine and the visual center is at the beginning of the bowel and I don’t know if it is the muscle or the pelvis but this is not a problem. But this is just a thought, something that I want to share. From my point of view, the center is the neurological system. What is interesting is that we know we have two brains, the right and the left. But more interesting, from a functional point of view, we have the frontal and one is the posterior. Every information that comes to the center goes to the cortex and goes to the posterior part. Everything that I wanna do comes from the frontal part. In Osteopathy we say we should switch from the frontal to the posterior part and feel when you want to listen more. So my personal point of view is that needs and desires is something that brings me out of this state or feeling. If I need or desire I am projecting me somewhere else and I am not here anymore and if I am here I have everything I want. I feel myself when something unexpected comes like a big mistake like Itay said. H: I would like to add something. It’s very interesting all these important and philosophical elements but what really bring me back is the dance and co-creating with people in improvisation and this wonder at all of the possibilities of movement and interaction that can come out of being together and interacting. For me it is very much creative –that’s what brings me to the dance. I: My question especially for the festival was What is really the point to be able to dance?. What motivates me to dance, to improvise? It’s not every time. I feel not every time. I loose a good friend a few weeks ago. I felt like I can never dance. It’s finished. I asked especially what can I do to come really into the idea to dance, to improvise. In the morning we had this bodywork –which is something you do that is something you don’t do on your own. That is a way. Your body do something, not you do it. To come into this playful feeling again. J: Why Contact? Why am I practicing Contact? That question I like, really. My answers are not very clear but I am always thinking in global terms. How is the consciousness in each of us? How is this work in contact playing with you? One thing I like is political -how for us is a special thing and how it allows us a space for a special sensitivity and meet our awareness with others. Like imagine our community–what type of things that happen in Contact that make us feel so good dancing as to wish our society would be like that. That’s what I’m interested in. Especially being in a country where there is not much space for contact, what of this way of thinking also in others and in interaction can be in the big picture and what amount of that can we bring back from here? K: For me, it’s not a question I relate and then I answer- that’s in myself every now and then in this environment. First of all, it’s extra intense, more than in a jam or a workshop for just one day. It’s being with a family for a whole week. It’s very intense. For me a jam, it’s not so easy. It’s demanding on the body, physically and metaphorically speaking. I relate to this challenge, every time I want to get into the jam or come out. It’s very much intense. It’s an amplifier of life and it’s quite moving. But I feel challenged by this situation and I find myself in these festivals a few times a year. I like Lior’s way of speaking about it too, like the vibing. It’s not a specific question but it’s something I come back to. I don’t know if I could live with this intensity, this extra awareness for a lot of years. For me it’s enough as it is. It’s fine. I need to work my way through, with my space and my moments to be alone for a while. That’s my question, I place myself in this place of challenge, to fly, to fall. A taste of not thinking and just moving, being surprised by a moment of a jam, you know that. You know that feeling of gravity, that magic- just being aware of gravity, the center, being in the moment. L: The word, ‘connect’ is mixing around with ‘Contact’. Connect; Contact. And I’m interested in how we connect and specifically the beginning. Earlier today before the film there was a discussion of how we begin a dance and it’s still with me. How do we begin a connection outside of movement or with movement? And how do I challenge myself to be accessible to different kinds of connection? What you said resonated with me (referring to early point about people who use wheelchairs). How accessible are we as a community? So that question of how do I begin a dance. Do I say today I’m going to begin a dance with only people I don’t know, that I’ve never spoken to, like a pre-decided score or do I just roll and see what happens. I’m just curious. I think we all find different ways to begin a connection and when we discover we are in a pattern of beginning with similar ways do we stay with the pattern or challenge it and try a new way? I was thinking of this today. I think Jashana talks about loneliness in a festival and I think this is a common feeling when you are in a big group of people. This is when I feel most alone. I feel disconnected when I’m with so many people that I should connect with.